Email us a writeup and photographs of your cruise to Pomene & we'll send you a cruise discount voucher. On the 23rd November 2017 history was made, with the first MSC Cruise to stop at Pomene in Mozambique - the lucky lady getting there was the MSC Sinfonia, which left Durban on the 20th November 2017, and first stopped at Portuguese Island and Maputo. 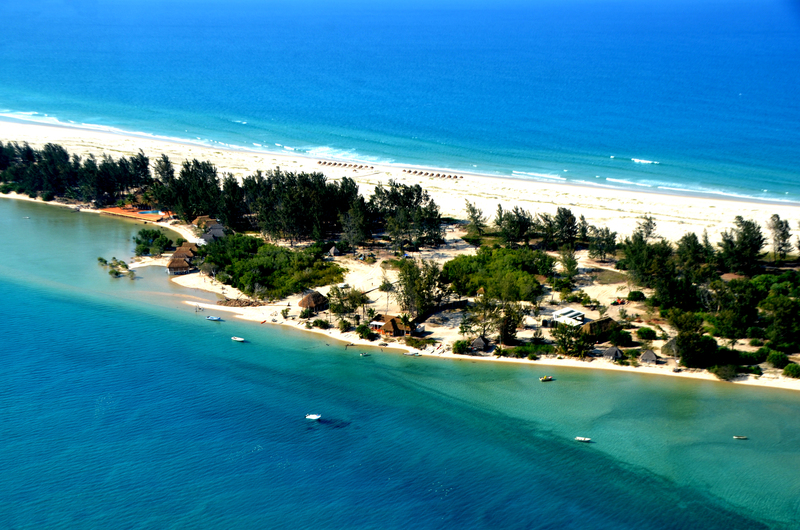 Pomene is a brand new cruise destination in Mozambique, an idyllic bar of sand seperating the sea from an estuary with a mangrove forest, which MSC Cruises have upgraded with shade and bars for your enjoyment. 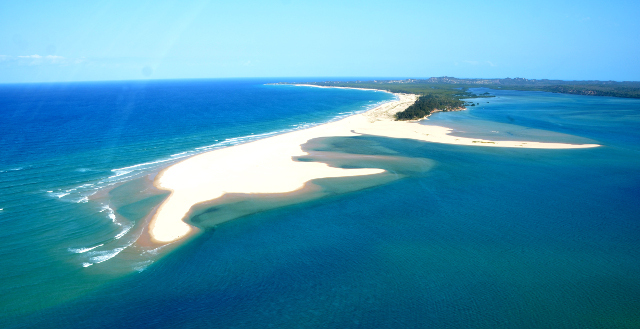 It's situated about 605km north of Maputo, with its remote location allowing it to maintain its pristine nature. Book cruises from Durban to Pomene on the MSC Musica or MSC Orchestra, by emailing cruises@southafrica.to. Note that due to rough waters it is sometimes not possible for passengers to be transferred to Pomene. Safety first. 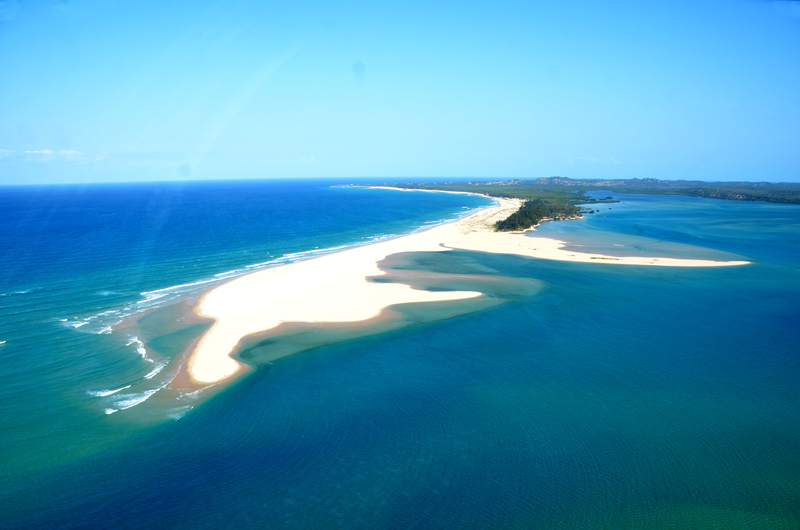 Here's a photo of the fingers of the Pomene sandbar sticking out to sea. 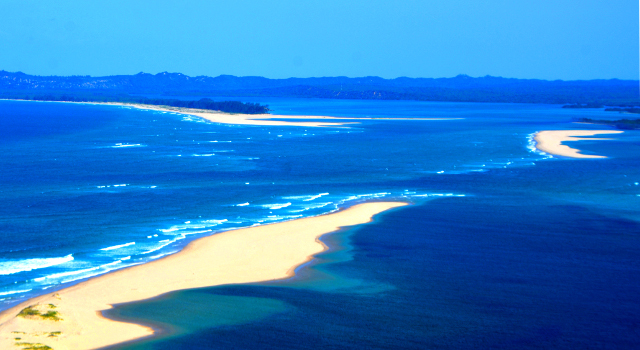 Imagine walking along the beach to the far ends of the sandbar's fingers, and the feeling of the enormity of the sea stretching out in front of you. On the beach shade is supplied by these thatched umbrella bali huts. 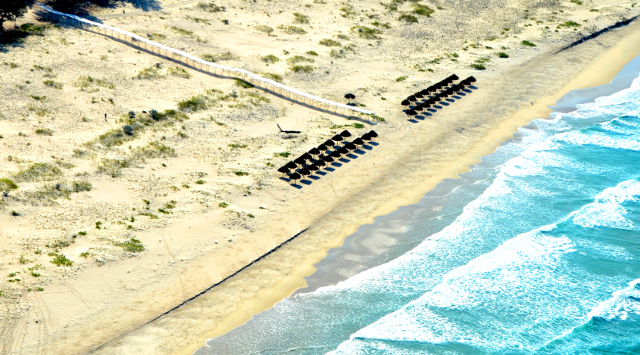 Here's an aerial view of the thatched beach umbrellas, and note the shaded walkway back to the "village" area, to keep you from burning your feet on the piping hot white sands. And here's what the walkway looks like from the ground. 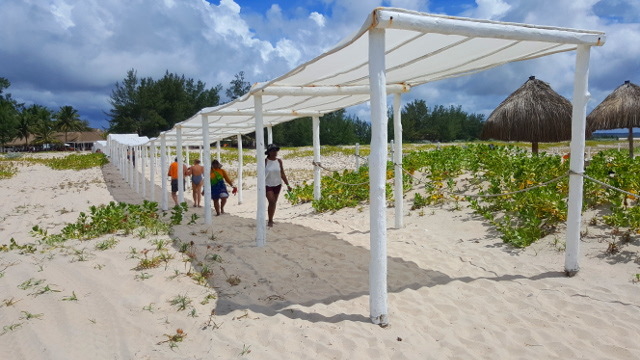 Warning - it gets really busy, with people migrating between the beach and the lodge. 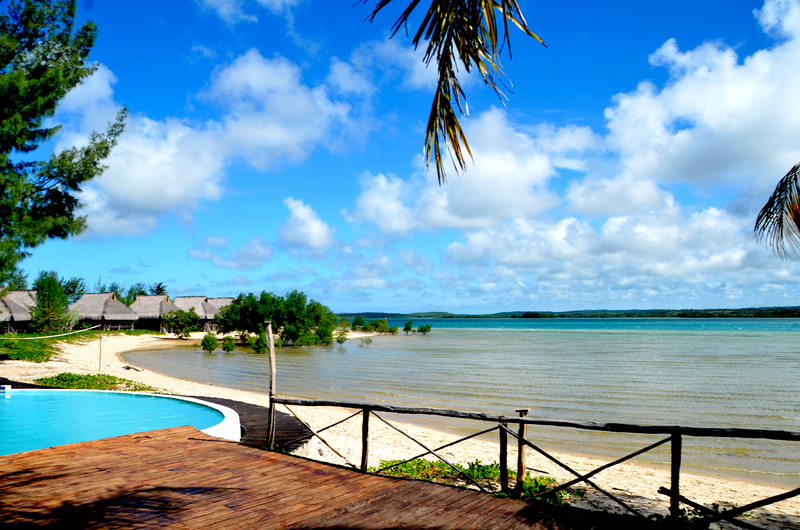 And behind the beach lies the MSC Pomene Safari Beach Club, from which you can launch your trips to the estuary, old hotel, snorkelling or fishing. If you're used to the 5 minute transfer from the Sinfonia to Portuguese Island, expect much longer for a transfer from the ship to Pomene; and the water to be rougher - you will ride through the swells/waves into the estuary, when we went at times the boat got airborne! There are 4 tender boats which each take some 80 people: the MSC Cuta, MSC Dorado, MSC Marlin and MSC Wahoo. 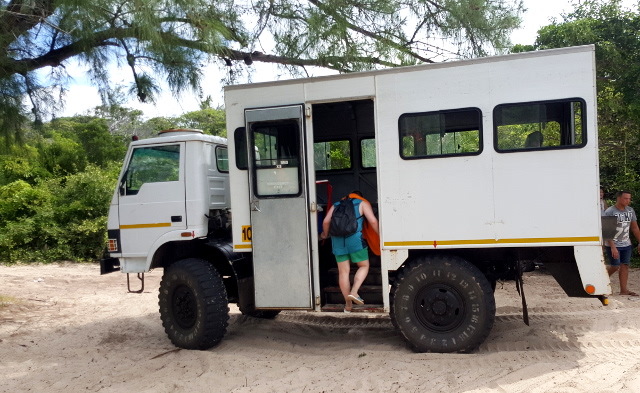 Get on a transfer as early in the morning as possible, as all the good spots get taken up by those who are first there (and if the water gets rough during the day, they may stop transfers). 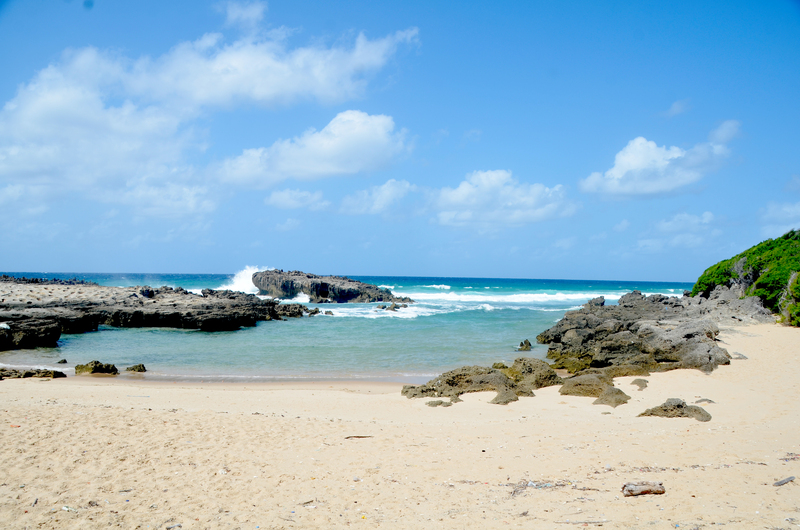 The sea sand is scorching hot, so be sure to wear sandals. Many passengers will spend their day splashing around in the sea and enjoying the lunch buffet, but there are also a bunch of interesting excursions. 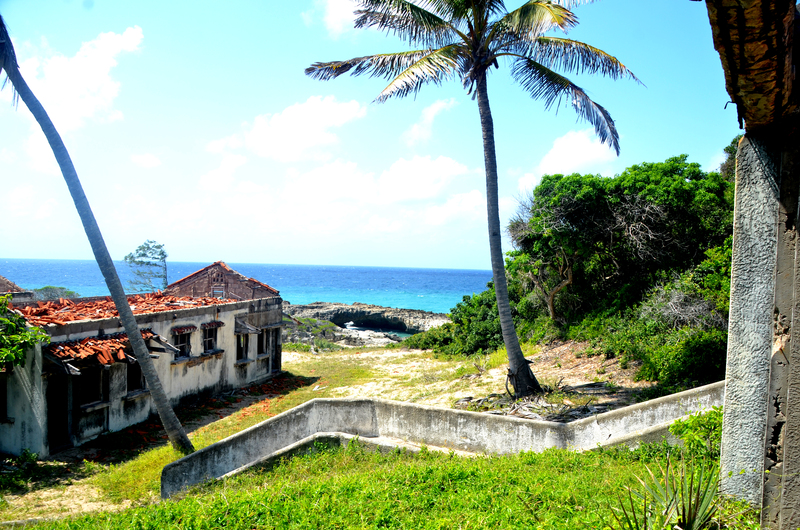 If you want to see the blow holes near the ruins, then time your visit there for high tide (click here to see when it is high tide). Here is a list of the excursions as at 10 Nov 2017. Note that excursions change over time, particularly when the destination is new (like Pomene) and it is still being observed what is popular and what is not. For the same reasons, prices have not been given. 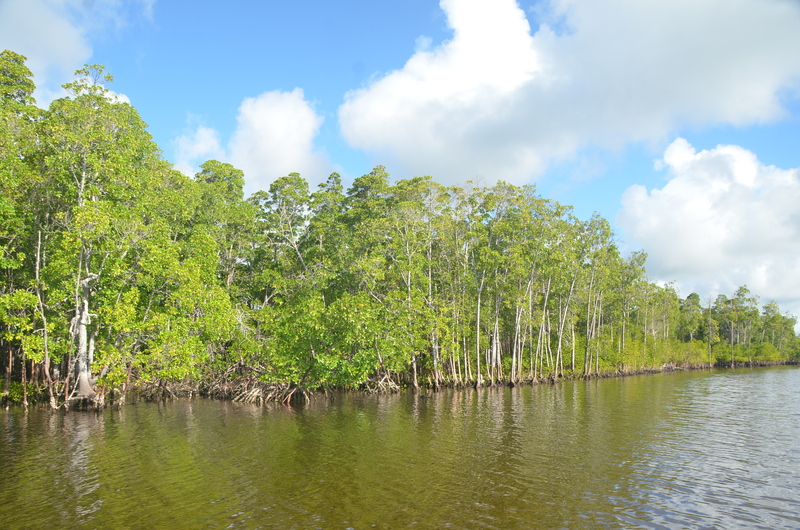 The mangrove forest is a stand out (literally!) feature of Pomene, and are an extraordinary sight. With the estuary protecting the forest from the sea - these plants appear to float on the surface of the water. 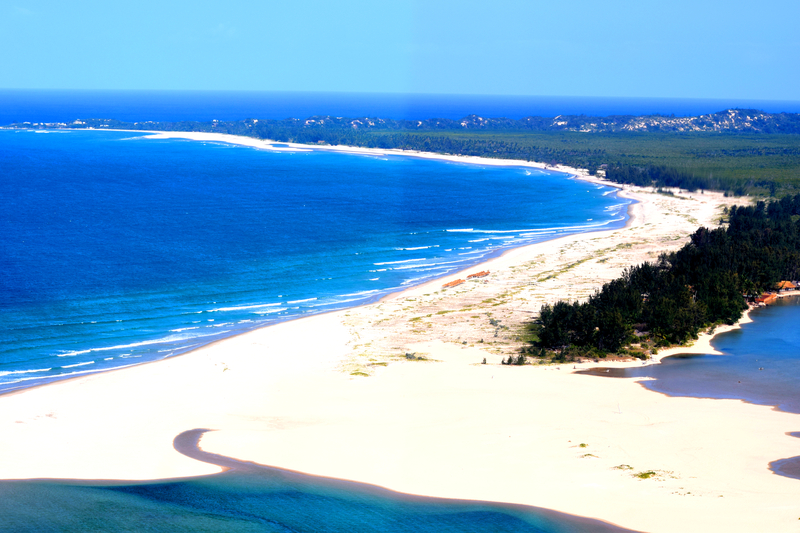 The Pomene Nature Reserve is a protected marine area that has managed to preserve its authentic and wild beauty thanks to its remote location. A trip to see the old Pomene Hotel - read more about it below. 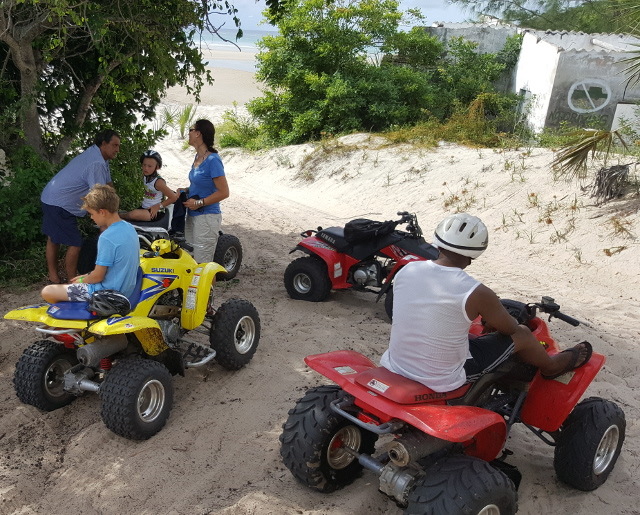 A more fun way of getting to the old Pomene Hotel is via quad bike. 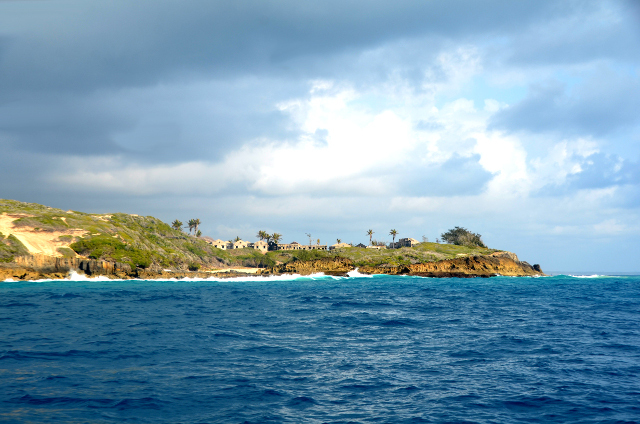 Navigate the waters of Pomene Island. Easy to learn, stand up paddle boarding otherwise known as Supping will give you the opportunity to enjoy views of the shoreline before returning to the beach. Guests are required to sign a waiver before joining the activity. You shouldo return the equipment on time, otherwise a surcharge will be applied. 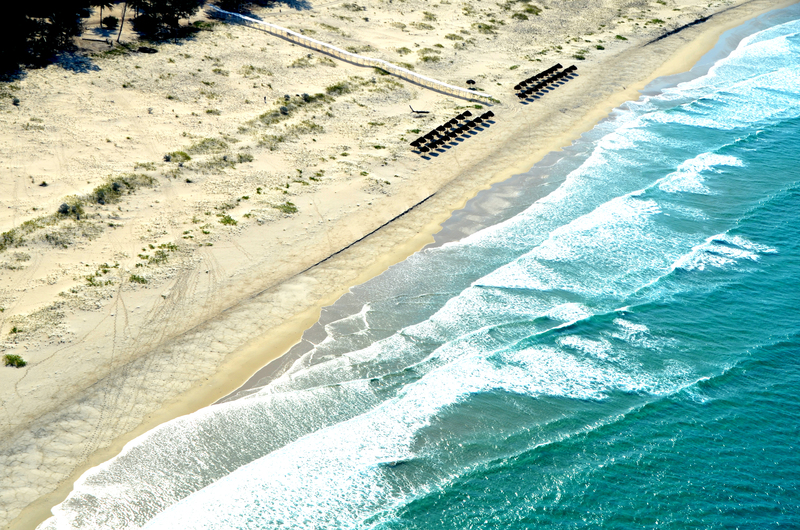 Gt a seaside view of Pomene, whilst punching your way through th swell on a kayak. A Pedalo Boat is a 4-seater pedal boat. 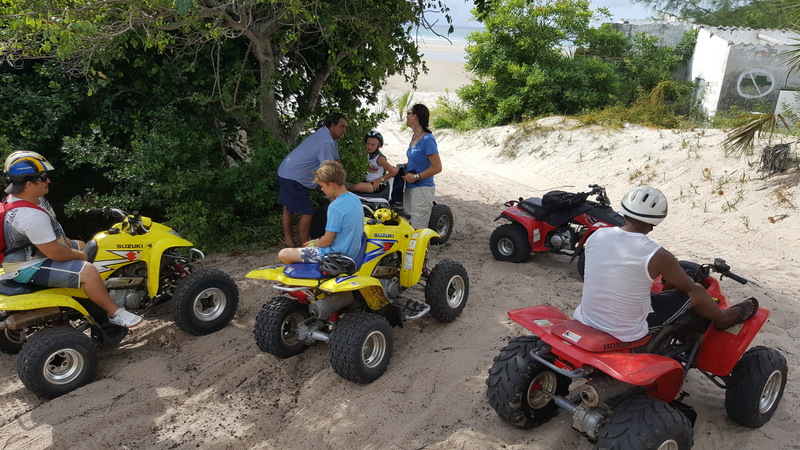 It its an hour's fun the whole family and you get a chance to explore the coastline of Pomene from a different perspective. Do physical exercise to th extent you enjoy. HOW IT WORKS: Pedals work by utilizing the peddling motion to rotate a paddle wheel similar to the form of a marine propulsion used in the earlier Paddle steamers. Go out by zodiac boat to the snorkel site where you can see numerous tropical fish in the protected waters of the Pomene. At depths of 3 to 5 meters you will find a wonderful variety of sea life ranging from potato bass to eels. Enjoy an approximately 15 - 20 minute boat transfer to reach the reef to begin your drift snorkelling from the boat. Your Equipment will include a mask, snorkel and snorkel vest. You may be amazed by the rich varieties of fish and abundant coral; but on the other hand sometimes the water is too murky to see much. Of course dolphins and whales are wild animals, and don't appear right on cue, therefore there is no guaranteed sighting. If you are lucky you will spot leaping dolphins and whales on this 1 ½ hour shore excursion as you head into the open ocean of Pomene in search of marine life. Dolphins and whales are part of the mammal family (cetaceans) as they are both warm blooded and give birth to live babies and not eggs. Go out snorkeling on your own by renting masks and snorkels for 30 minutes so you can explore for yourself at your pace what lies underneath. Not only can you go on the excurions and enjoy the beach, but MSC have also set up the MSC Pomene Beach Club; offering you use of a swimming pool, spa services and beach bars; and of course a club house. And the kids have not been left out - there's a play area with a jungle gym and activities organised for the little ones. Two cabanas have been set aside for MSC Aurea spa treatments. And if you're worried that you'll be destroying the environment by going there, you'll feel a bit better to know that MSC have a policy of leaving no rubbish at Pomene - all the rubbish is taken back to the ship and disposed of in Durban, where they have proper facilities for that. 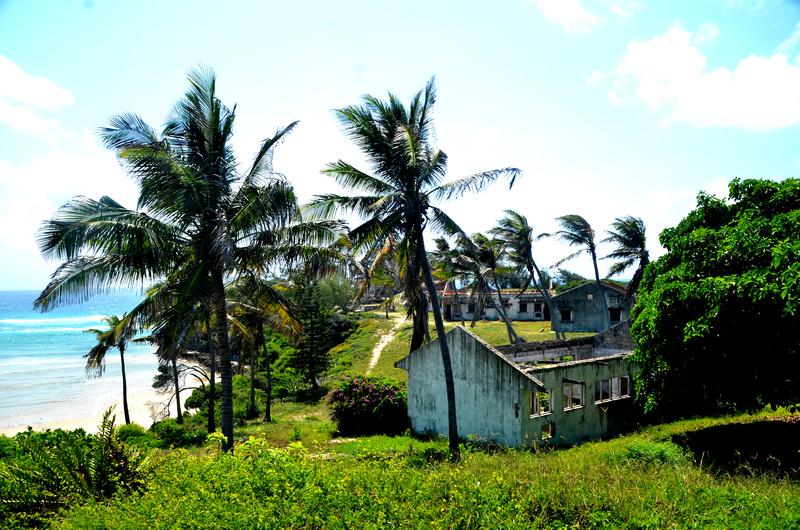 If you enjoy a sense of history, then be sure to go on an excursion to see the ruins of the old Pomene Hotel; which was built in 1964 by Portuguese colonialists and damaged during the civil war. The catalyst to the building of the hotel was the "discovery" of Pomene in 1960; when a ship carrying a valuable cargo of sugar ran aground in the area. 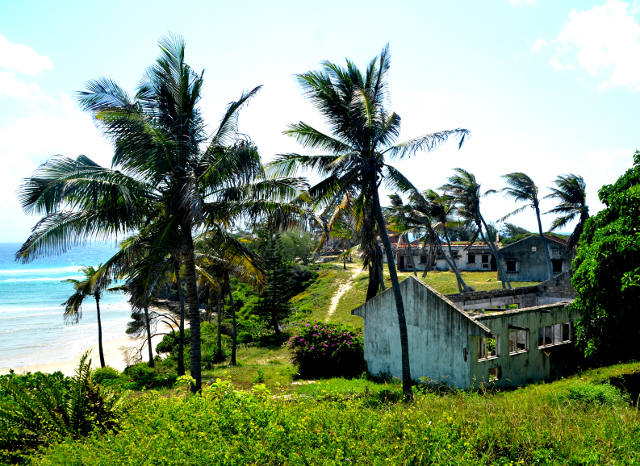 Looking at the ruins, one can almost feel the enjoyment and sense of excitement from past travellers from a bygone era. 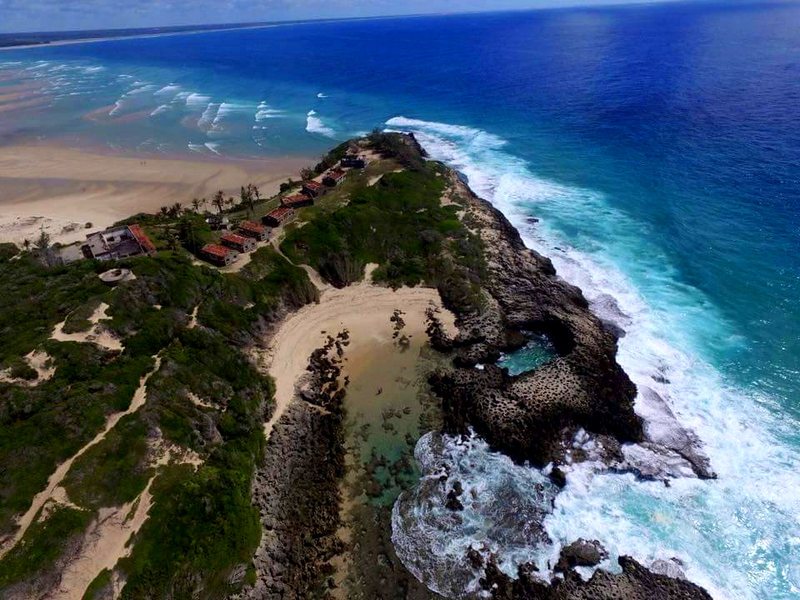 The hotel was well positioned alongisde a beautiful beach - paradise rediscovered. 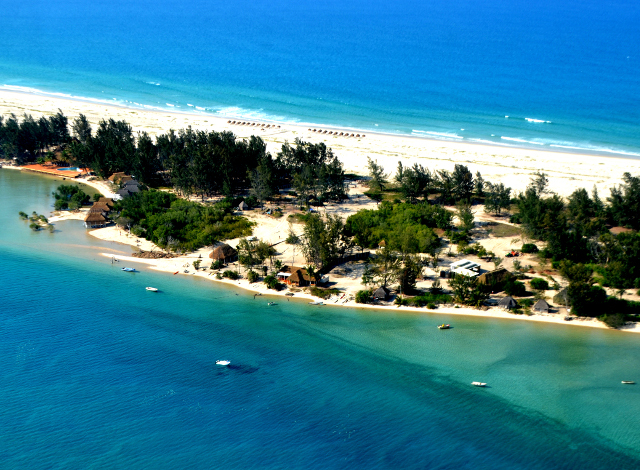 Enjoy Mozambique's signature turqoise blue waters. 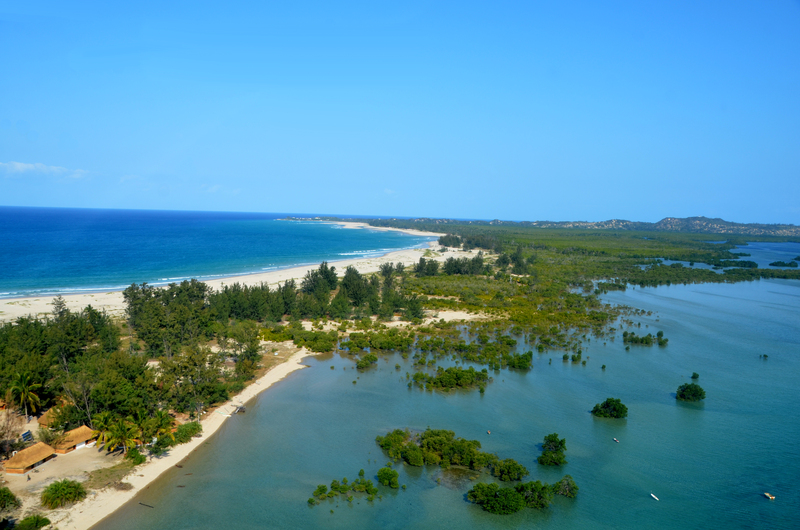 And here's an aerial view of Pomene Point, with the old Pomene Hotel buildings clearly visible, as well as the beach with the blowholes. For us, Pomene's blowholes were the highlight of the entire cruise - a natural phenomenon we'd never before experienced, and were happy to tick off the bucket list. As waves approach the rocks they force spray through vertical holes which they have over hundreds of years carved and eroded into the weak points of the rock. The blowholes are situated at the beach below the ruins of the old Portuguese Hotel. 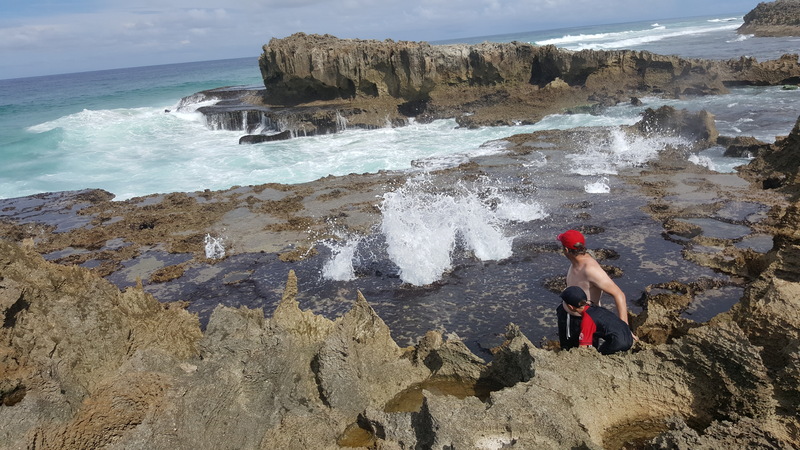 Legend has it that in days of yore if hotel servants misbehaved, they were thrown into the blowholes. 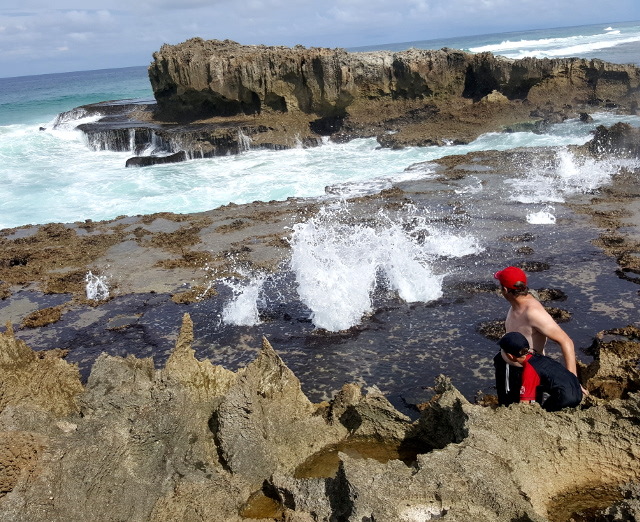 Naturally, walking amongst the blowholes is dangerous, especially for children, as you could accidentally slip and fall into one (and it would be very difficult to survive being pounded in the rocks below the blowholes). The danger is made more dramatic by the whistling sound one hears through the blowholes. 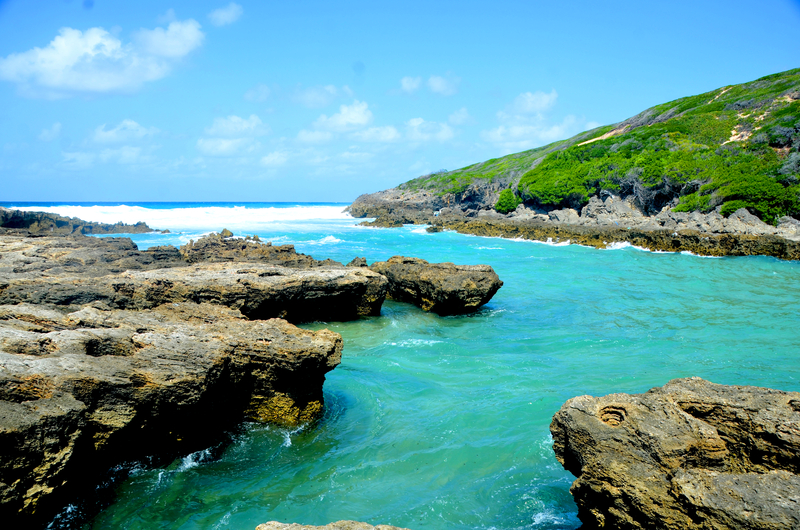 It's important to note that the blowholes work best approaching and during high tide, so this area should be visited then. Click here to see when high tide is. Here's a video of a couple of tourists having a blast at a blowhole, by positioning themselves so that the blow goes right up into them! 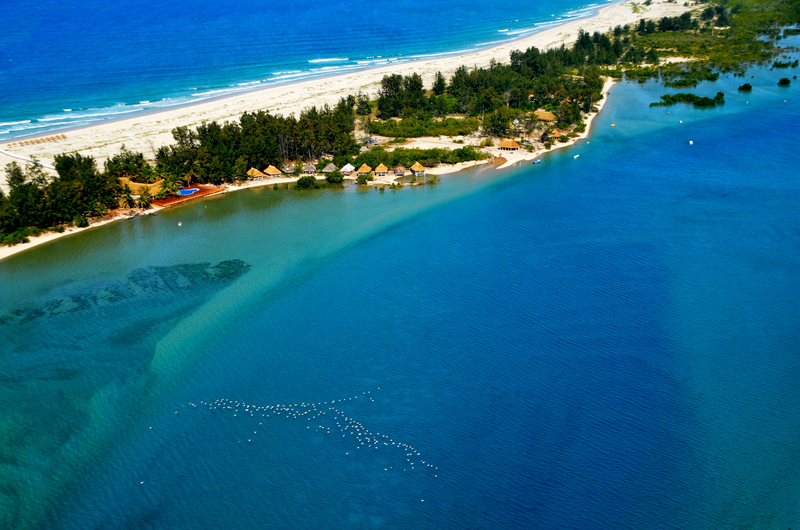 Paradise Beach Lodge forms one of the few existing structures on the Pomene sandbar. 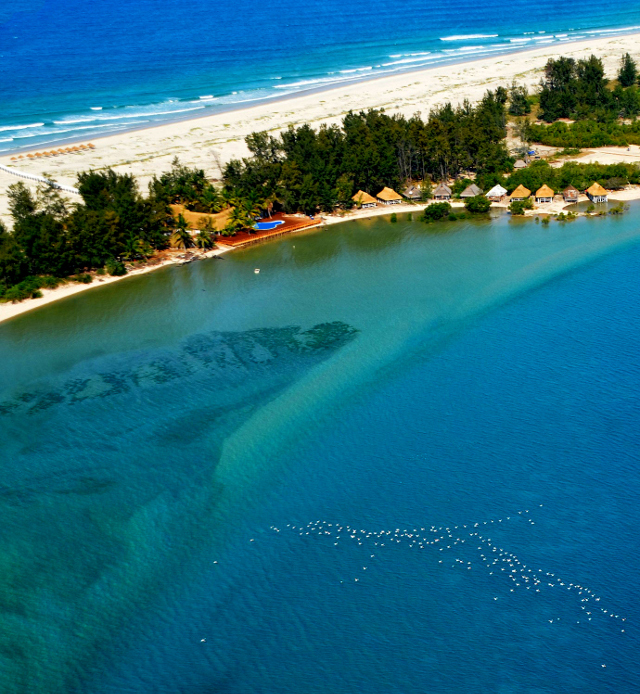 They offer snorkelling, diving, deep sea fishing and boat trips out to the mangrove swamps and in the estuary. It's not clear yet whether you'll be able to book this through MSC. 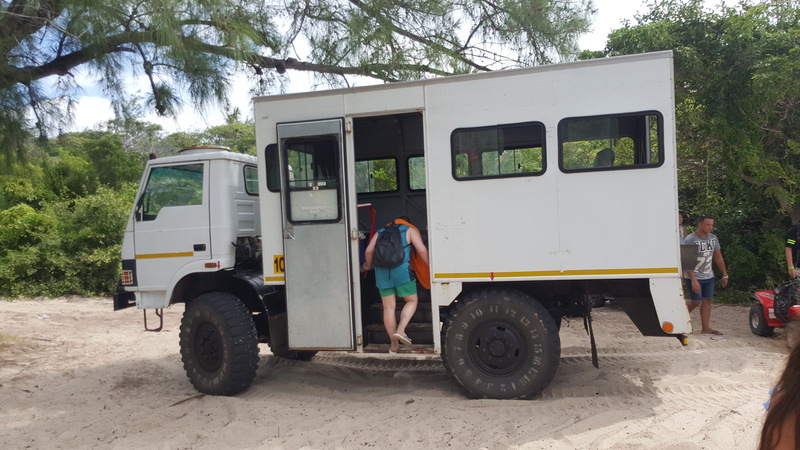 If you want to go scout out the area before your cruise, they offer accommodation in their thatched-roof lodges (you'll need a 4x4 to drive in). 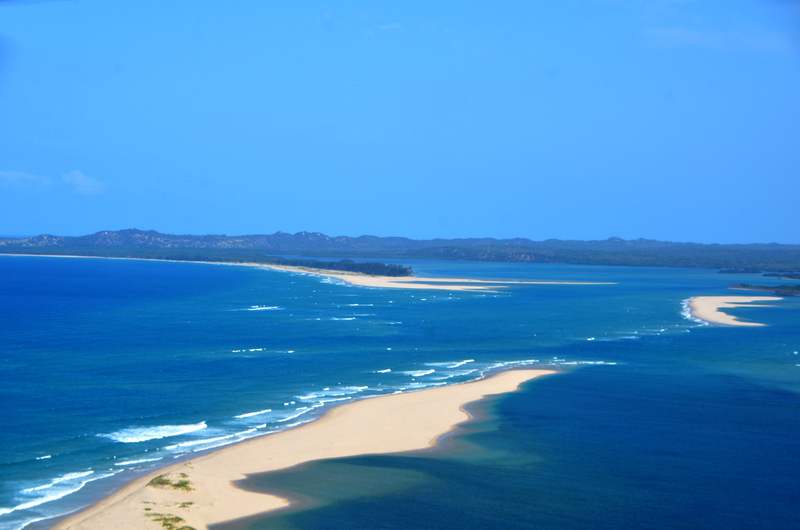 The easiest way to get there is by flying from Johannesburg to Inhambane, and then taking a 4x4 minibus to the lodge. Click here to read about them on their Facebook page. To cool down in non-salty water visit Pomene Lodge; and enjoy views over the estuary. 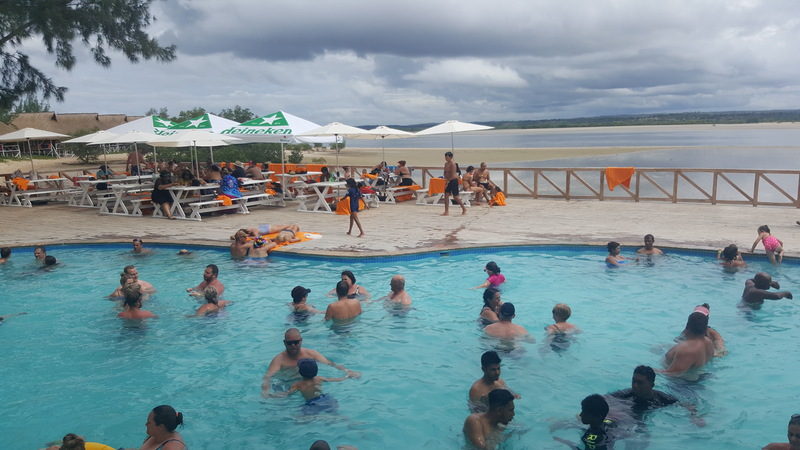 The pool faces onto the estuary, and gets fairly crowded when the MSC's passengers are there. The Pomene Hideaway is accommodation on the southern end of Pomene, right on the other side of Pomene from the landing point the MSC boats will be ferrying passengers to, so you are unlikely to see it, but here's a nice video they set up. 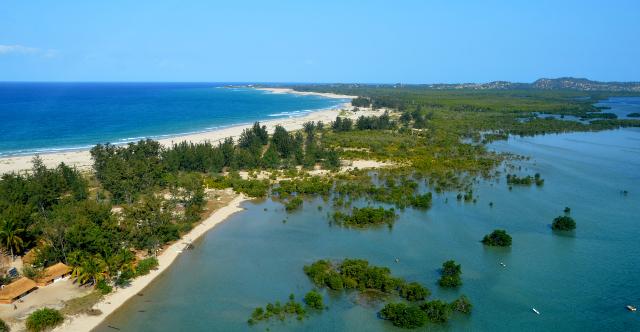 The word mangrove makes one immediately think of Florida (coincidentally the major launching point for cruises into the Caribbean), but here in southern Africa we have our own mangrove forest, in the pristine Pomene estuary - and this is what makes Pomene so special. 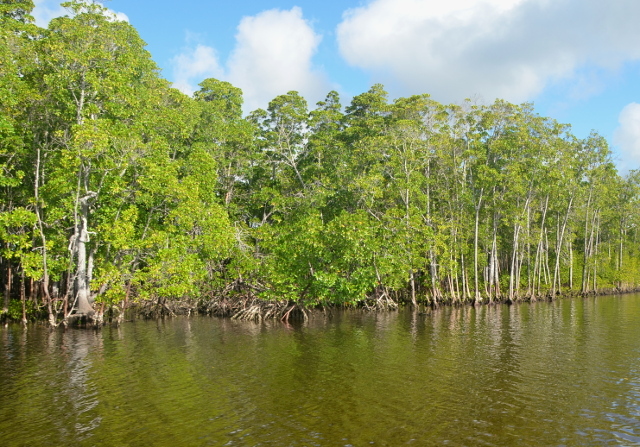 The mangroves can easily be recognised by the rooting system which props the trees above the water level (which makes them look like they're "floating" on the water). The roots of the plant are a favourite spot for fish to hide away from predators, and are a good spot to snorkel or kayak. 8 Nov 2017. The first landing at Pomene was meant to happen on the MSC Sinfonia, but couldn't take place due to inclement weather. This highlights for clients that safety is always the number 1 priority, and becasue of factors like the weather it's not possible to plan with 100% certainty what is going to happen. As one does more and more cruises, one learns to surf the wave as it appears. 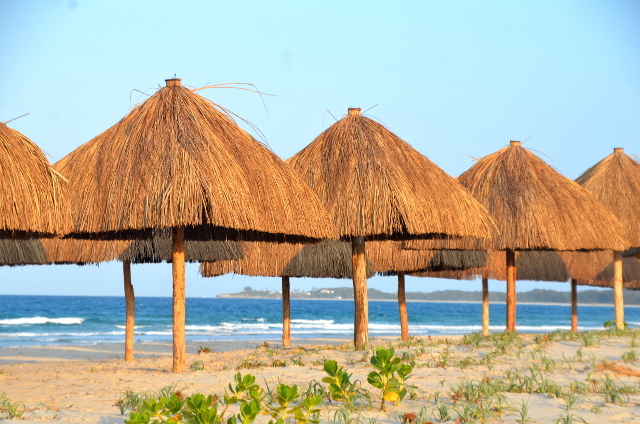 Here's the beach where you can lie under thatched umbrellas. And just in case you were thinking of getting some cellphone reception in Pomene - forget it - it's too remote, which is part of the attraction. 5 Dec 2017; Leigh Lai Wing wote: "My wife and I recently concluded our 2nd stint onboard a MSC cruise ship (Sinfonia this time) and once again, it was a a thoroughly enjoyable experience! From the always helpful and friendly staff to the exquisite Mediterranean fine dining in the evening, we were left wondering just how they could fit all the entertainment into such a reasonably priced excursion. And speaking of entertainment, make sure you never miss any event in the San Carlo theatre, Stephen Cloete and his dream team are hillarious, informative and entertaining in equal doses. 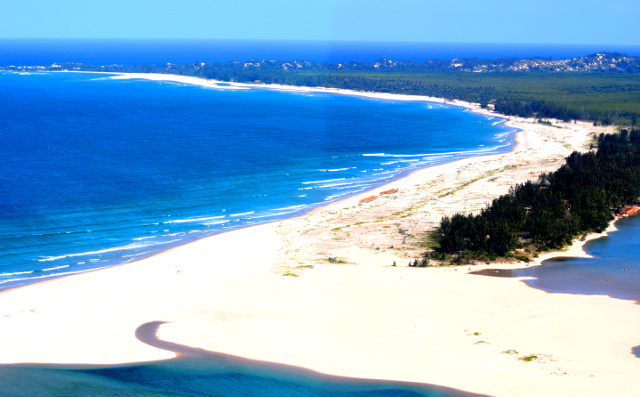 When you aren't on the ship enjoying one of its many luxuries, the pearly blue waters of the Portuguese island and Pomene will accept you into its bosom. I especially enjoyed Pomene. It is a new edition on the MSC itinerary and boy is it an exciting trip to get there. Meandering through mangrove scattered estuaries to reach the white sandy beaches of Pomene, the whole trip from the anchored ship takes about 20 minutes. 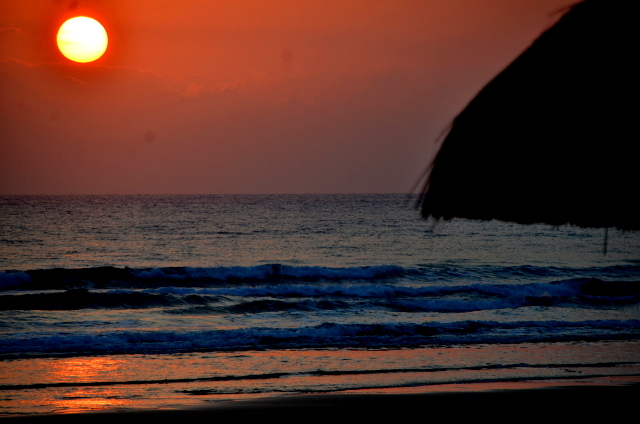 In closing, well worth the effort to get all the way to Durban :) We will be booking a longer cruise shortly. Special thanks goes out to Devprakash Ramchurn and Bala Parama, a Mauritian duo of concierges and Mr. Silva from India. They really went out of their way to make this trip the best one so far."